Taggloo is slowly but surely growing in popularity and this brings greater demands on the software and demands on its maintenance. You could say the problem with launching a web site is that people will start using it! Alongside this my own time is curbed somewhat due to study obligations so time spent on Taggloo’s upkeep was rare – but not entirely neglected. Alongside an increased collaborative effort within the Manx Gaelic community which will see more resources made available for users, the site has had to be refitted to include new features and content over the next 12 months. In order to accommodate these changes (some of which are quite exciting), the site has been rebuilt to work on cloud infrastructure delivering increased reliability and [hopefully] performance. The development experience is also made significantly easier and deploying code is now much more reliable and faster, allowing more updates to be released – more often. Keep returning to the site to make sure you don’t miss out! So what’s new in this new [first] version? Whilst I’m still fond of the old design, it was somewhat restrictive in terms of the upcoming plans and changes that are being discussed. We needed to change the site to accommodate new sections, functions and content. 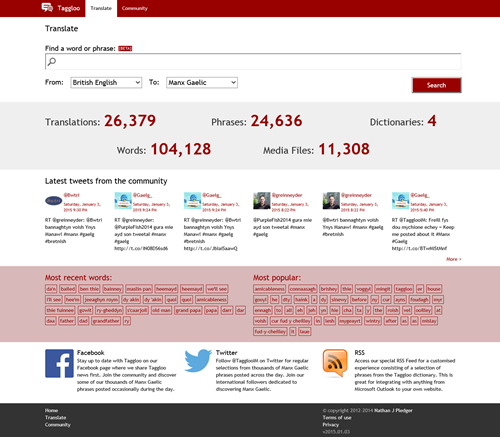 The new design retains the easy to use search form, allowing you to enter your translation requests as before, but adds new sections which can contain information about the dictionaries, statistics and social media engagements. The stratified-design hopefully separates types of content and the reactive design will work in all browsers no matter their size. When translating a word, you might find a new section in your results including audio files of Manx Gaelic speakers pronouncing the word to help you understand word’s true sound. The words are from Phil Kelly’s collection of over 6,000 individually recorded sound samples. These sound files have been indexed against the existing Taggloo dictionaries, providing over 10,000 opportunities for search results to include media items. It’s well worth taking some time to listen to these sound samples to understand the differing dialects and accents within the language. 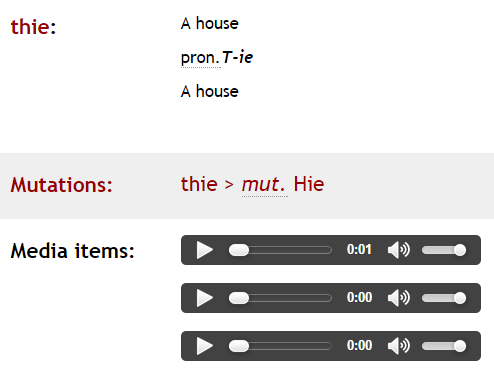 The sound samples are playable in all HTML5-compliant browsers, though some browsers don’t support all of the formats of sound files within the dictionaries. We’re working on this, but in the meantime, to be sure that media can be played, consider using the Google Chrome browser. There are a whole bunch of new features coming, not all of which can be published right now. Expect to see improved social media integration and improvements in the presentation of results and social media engagements. A key feature planned for development starting in a few months is a reimagined data structure of the dictionaries allowing machine-learning and free-form phrase translation, a feature requested by many users for some time. A benefit of the new hosting platform is much greater visibiltiy of the performance of the site, but your input is still extremely important. If there are any issues or feature requests, do get in touch using the form available on every page of the site. And keep returning, Taggloo’s new home enables much more frequent updates to be made which you wouldn’t want to miss.